This 3 in 1 Kids Activity Table Set was designed to inspire creativity and grow with your child. The inside makes a great water table for hours of fun and doubles as a storage space for building bricks and other toys. The Building Brick surface provides a surface on which your child can build fun, imaginative worlds. And the smooth side is the perfect place to make crafts, draw masterpieces, and more! This durable 3 in 1 kid activity table will entertain kids for hours as a water table, building brick table, and smooth general-purpose activity table great for drawing and crafts. Compatible and guaranteed tight fit with all major building block sets. Includes 25 jumbo bricks so your kid can start playing right away. 3 IN 1 TABLE will entertain kids for hours as a water table, building brick table, and smooth general-purpose activity table great for drawing and crafts. Inspires imaginative play as your kids splash, build, and create! INCLUDES 2 CHAIRS & 25 JUMBO BRICKS for instant fun. Compatible and guaranteed tight fit with all major building block sets. 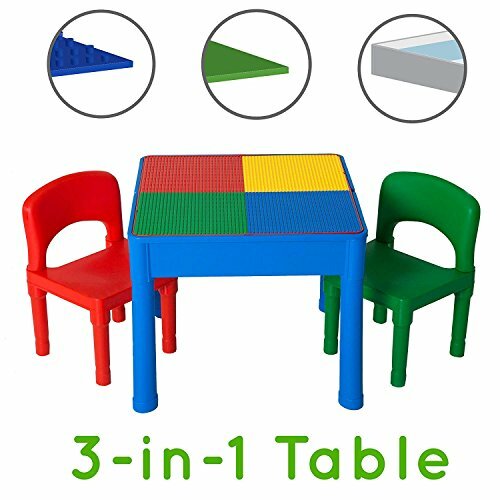 BUILT TO LAST - This kids activity table set is strong, durable, and easy to switch from building brick side, to smooth side, to water table. CONVENIENT STORAGE - Interior provides convenient storage for building bricks, craft supplies, water toys and more. GREAT GIFT for boys and girls ages 18 months and up. Inspires creativity and grows with the child. 20" x 20" x 17" table. Chairs are 18" high and the seat is 10" off the floor. REPLACEMENT WARRANTY - Play Platoon stands behind all of its products 100%. The 3 in 1 Kid Activity Table comes with an automatic 1 year warranty. Register online for a FREE LIFETIME WARRANTY. This product is not affiliated with or endorsed by LEGO. LEGO is a trademark of the LEGO Group of companies. If you have any questions about this product by Play Platoon, contact us by completing and submitting the form below. If you are looking for a specif part number, please include it with your message.